Two new buildings vividly underline the contrasts and breadth of possibilities of the latest stages in the revolution of engineered timber — and particularly Cross-Laminated Timber (CLT). One is large, towering above a rail junction in north London and has been visited by a stream of developers, planners and housing consultants, looking to find ways forward in off-site housing strategies. The other is small, though speaks poetic volumes through its delicate, raised structure, while heralding the potential of advances in healthcare design. The first building, Dalston Works, which completed in November, is the latest and most ambitious yet in the story of Hackney’s unlikely emergence as one of the CLT building hubs. Trailed as the largest CLT building in the world, with 12,500 sq m of residential and 3,400 sq m of commercial space, the 10-storey set of housing blocks is also Waugh Thistleton Architects’ first major timber-build statement after its 2009 nine-storey Murray Grove, which trailblazed CLT in Britain and further afield, helping kick-start the race to design ever-taller timber towers. The competition has only accelerated, as more ‘tall timber’ CLT projects around the world receive the go-ahead, from Vancouver (Shigeru Ban’s 19-storey Terrace House) to Vienna (Rüdiger Lainer + Partner’s 24-storey HoHo project). 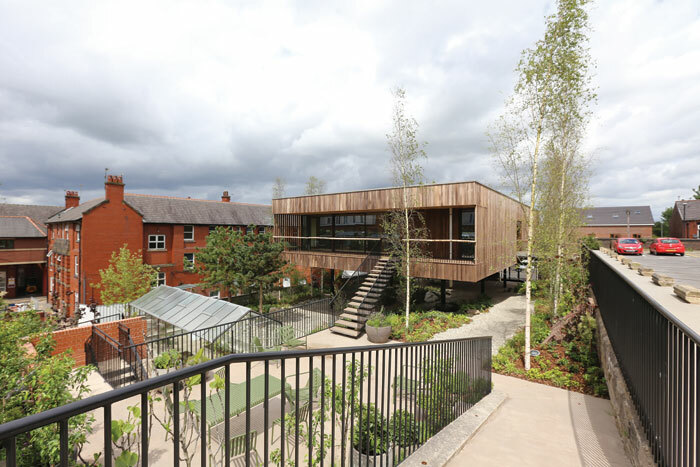 If Dalston Works demonstrates CLT at ever-increasing scale, dRMM’s recent Oldham Maggie’s Centre introduces a broadening of the CLT palette. The small, delicately balanced timber box is the first building to use a hardwood — tulipwood, aka American poplar — as structural CLT. As such it fits well within the experimental lineage of dRMM’s timber projects, which long predate Murray Grove; Alex de Rijke — the dR in dRMM — first encountered CLT at the pioneering eco-materials outlet, Construction Resources, in 2001. For Oldham, the much darker-hued new hardwood CLT is applied as cladding and used structurally in its walls, offering both practical and aesthetic paths, as already seen in dRMM’s earlier Endless Staircase (2013) and 2016’s Smile Pavilion by Alison Brooks, both created for London Design Festivals. 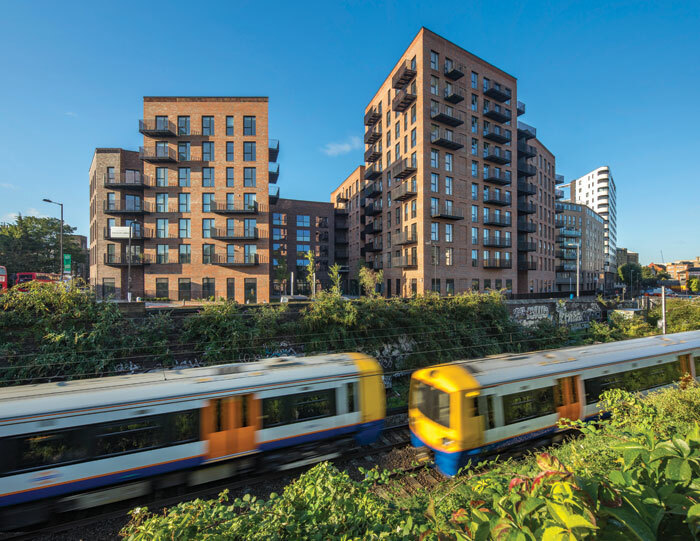 As one of those who has contributed to its development, de Rijke is quick to point out that hardwood CLT ‘significantly expands the family of engineered timber.’ Compared to Dalston Works, Maggie’s Oldham is a small project. But size isn’t everything. Long fascinated by ply and industrially processed timber, dRMM is no slouch at large-scale CLT projects (last year’s Trafalgar Place housing being a recent example), or other timber-led structures, the latest instance being the Stirling Prize-winning Hastings Pier. In Oldham, a poetic and sensitive side is to the fore. Sitting on slender steel columns at the western edge of the Sir Norman Stoller General Hospital, the open ground below the building is given over to a stony garden designed by Rupert Muldoon. At the centre of the garden a thin, young birch tree has been planted, its silver trunk rising up through a circular opening cut into the middle of the building. Inside, the tree’s leaf canopy quivers and bends on the other side of the glass. Externally, the darker-hued CLT cladding looks like a particularly organic corrugated metal; while inside, the hardwood CLT is equally evident along the walls, floors and ceiling, giving a benign stillness to this refuge helping people deal with cancer. The calming effect of wood is part of de Rijke’s broader argument about wood’s many benefits. ‘I think tulipwood is a really beautiful material,’ de Rijke says, touching the finely grained timber. Structurally a double wall on the centre’s southern face, with two offices, toilets and other facilities sandwiched between the two curving walls, helps carry the load. The sensitivity extends to the broader materials palette, including cork wall screens and oak door handles, and raw uncut birch for the railing along the balcony. This is a rather different palette to dRMM’s usual application of bright, and at times, gaudy, colours, turning Maggie’s Oldham into an unusual dRMM project; one where their eco-sensibility is worn on their sleeves, rather than, mainly invisible on the other side of the walls. For de Rijke, the organic materials complement healthy organic food; the two are the exact ingredients so missing from both the NHS and so much of public architecture. ‘In wood,’ de Rijke writes in a particularly personal essay on designing the Maggie’s centre, ‘there is hope.’ De Rijke’s words are weighted with an intense emotional charge, since throughout most of the project he nursed his girlfriend, Lucy, who was suffering from terminal cancer. 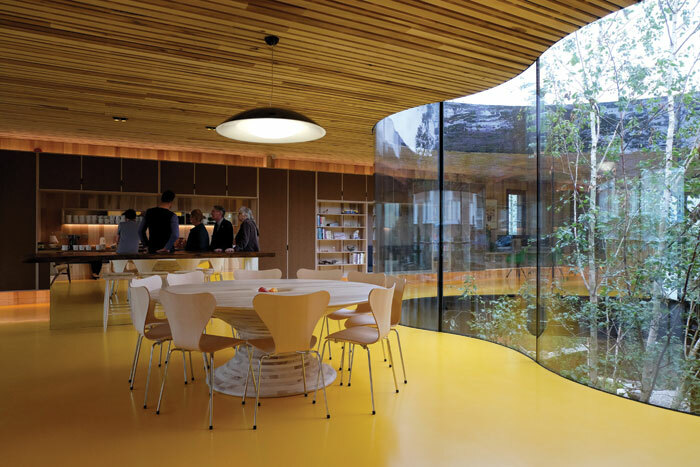 De Rijke’s Maggie’s centre foregrounds an advocacy of a sustainability that embraces the warmth of natural materials; a meeting space between what sustainable-design theorist, Jonathan Chapman, calls ‘emotionally durable design’ and the architecture of hope. As it is, both Maggie’s Oldham and Dalston Works are prescient. Not to put too fine a point on it, the two projects have arrived amid what’s being called the ‘timber rush’. 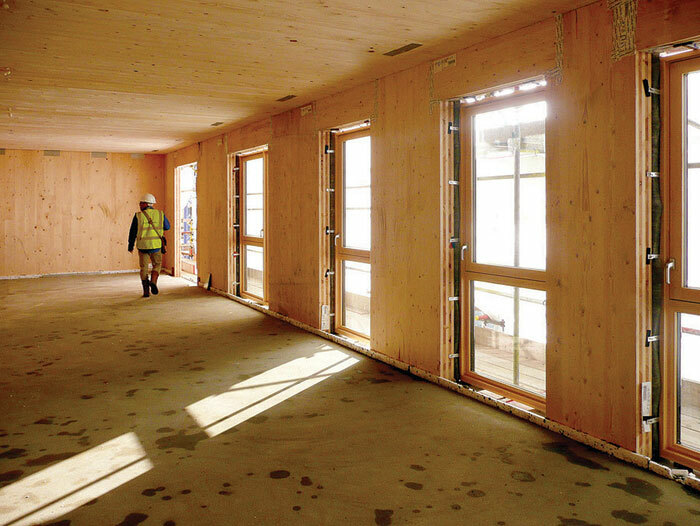 All over Europe — and indeed the planet — there is talk of new CLT factories opening. There are new CLT projects, both large and small, starting and being completed. The arrival of CLT in the mainstream is the result of more than two decades of research and development, centred around Graz University in Austria. The panels, originating from mainly Austrian factories, comprised of three layers of glue laminated solid wood and are structurally strong and flexible; they can be further processed into customised sections by CNC routers. Comparative lightness, speed of construction, and easier, quieter working conditions are all contributing to competitive CLT attractiveness compared to concrete and steel. 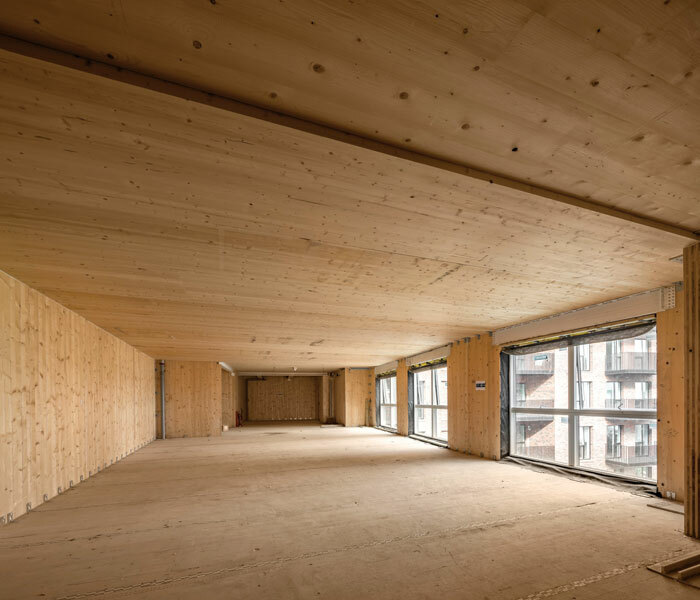 This is before the sustainability dimension, which is considerable; on average 750kg of CO2 is stored in one carbon tonne of CLT, one reason Dalston Works can be described as carbon negative. In countries not traditionally known for timber — Denmark, for instance — CLT is now being taken seriously: Vand Kunsten is completing the country’s first CLT housing development, FBAB, as part of the Lisbjerg sustainable district development in Aarhus. What’s more, the Paris Agreement on climate change requires architects to meet new, more challenging sustainability briefs. You can find CLT projects in Australia, South East Asia, and North America. Worldwide, it was estimated that 650,000 tonnes of CLT was used in 2017, with confident predictions by CLT manufacturers and academics of one million tonnes by 2020. And then there is the timber towers race. PLP Architecture’s 80-storey Oakwood Tower with engineer Smith and Wallwork, standing high above the Barbican, brought on gasps of shock after the images were released in 2016 — though you needed to read the small print: for the time being it was strictly conceptual. Not only this, but these larger (and taller) projects are timber-concrete hybrids, not pure timber. While these reach-for-the-skies displays can come across as virility competitions they do signal the level of change afoot. Another sign of CLT’s mainstream take off, in the village of Sherburn in Elmet, 15 miles east of Leeds, Europe’s largest CLT factory is up and running. Set up by insurance giant Legal & General in 2016, the factory’s arrival sends another signal of the ramping up of CLT-based manufacturing. The factory includes a dedicated lamination plant, CNC production and 12 production lines. Once fully operational, the aim is to roll out 3,000 pre-fabricated CLT modular buildings a year. Indeed, if any one building demonstrates the arrival of CLT in the mainstream, it is Dalston Works. Built on a tight site with difficult access, a much-reduced construction crew and build time, and working on a dry rather than wet — concrete — site, along with 8% lighter materials, means a considerable reduction of impact on the local community. The design is focused on the form of lightness, using 20% less timber than Murray Grove, the result of a steep technical learning curve. 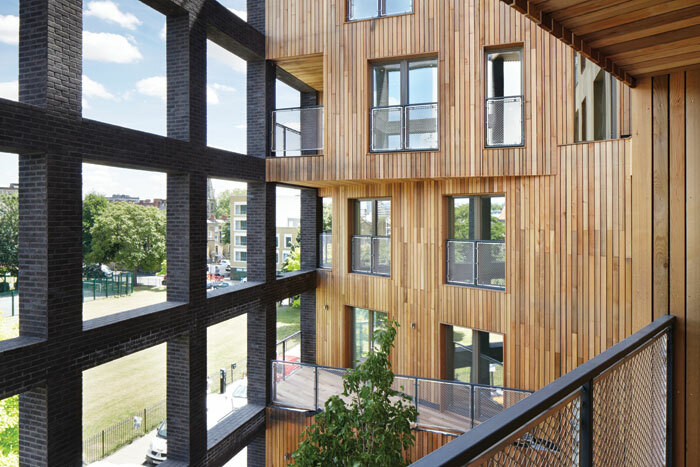 If the Hackney tower put the young studio on the map, it also propelled Waugh, and practice partner Anthony Thistleton, into the limelight as international ambassadors for the engineered-timber revolution. Thrust into larger international debates, and presenting to the likes of UNEP, the practice began to realise just how high the environmental stakes are, repositioning Waugh Thistleton as a timber-first studio. Waugh, a self-confessed meat eater and a man who has driven fast cars for pleasure, at times speaks of CLT these days with the zealotry of the true convert, having become, alongside de Rijke, one of the most committed timber evangelicals in the UK. In the meantime, Waugh Thistleton, along with other London practices completing high-profile projects — Karakusevic Carson’s Bridport House and Hawkins\Brown’s Wenlock Cross projects — have turned Hackney into a surprise CLT and engineered-timber world centre. It’s early days regarding the extent to which other local authorities follow Hackney down this soft ‘timber-first’ approach. 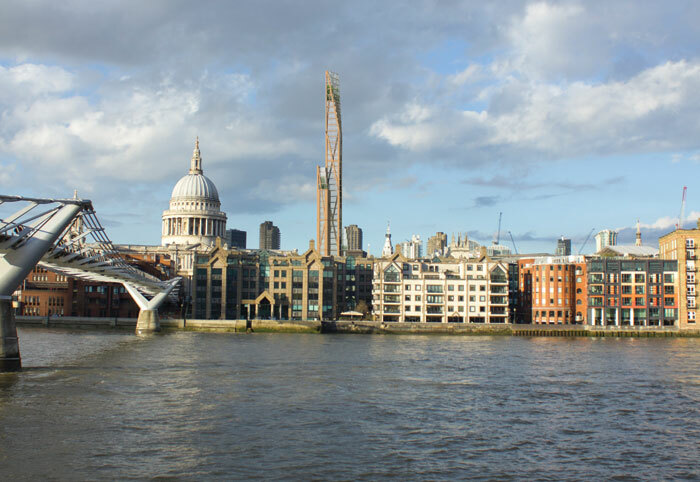 The Grenfell Tower tragedy drew heightened attention and concern to the flammable nature of tall-building materials. Timber is particularly associated in the public mind with fires, and this perception inevitably brought renewed attention to the wave of larger CLT buildings being created. Waugh points to how no CLT projects have had any problems, and that technically, timber chars, burning slowly, rather than melting and collapsing, like steel, and is considered much less of a fire hazard by fire-risk experts than is often realised. He adds that Waugh Thistleton’s buildings conform to and go beyond the various fire-risk standards required. This said, Waugh states he isn’t an advocate of tall timber for its own sake, and that both the more interesting, and more relevant, developments are happening within the medium scale urban blocks that the practice have focused on. This medium scale has become one of a spectrum of different, contrasting approaches that are becoming apparent.High profile though the timber-tower wave may be, for the likes of de Rijke and Waugh the approach is a distraction, with the material adopted without impacting substantively on the design thinking of these architects. But Waugh Thistleton and dRMM are beginning to contribute to a genuinely 21st-century wood architecture. Here, CLT is being integrated into the wider family of engineered timbers: glulam, Laminated Veneer Timber (LVL) and European hardwoods. By exploring timber’s particular design, engineering and aesthetic properties, these UK practitioners are following the lead set by architects and engineers — such as Hermann Kaufmann and Gerhard Schickhofer— who are mainly from the Alpine timber powerhouse countries of Germany, Austria — where CLT originated — and Switzerland. 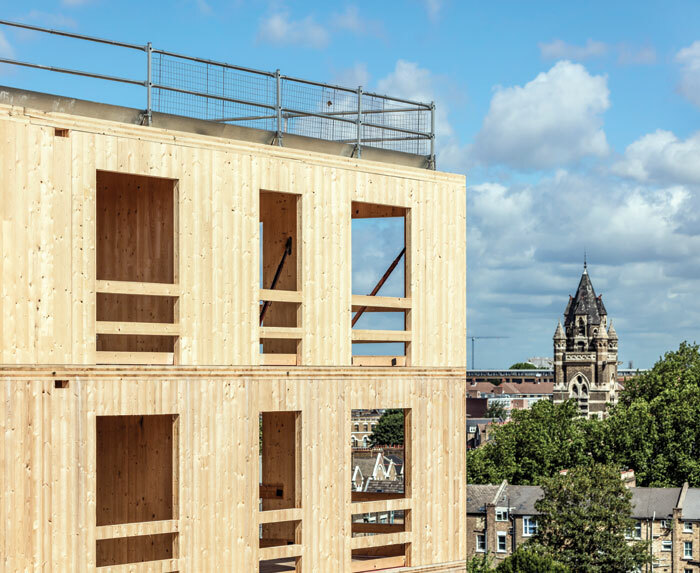 It’s a fluid and changing landscape, but look back from, say, 2035 and this period will likely be considered a threshold moment for CLT and the engineered-timber revolution.